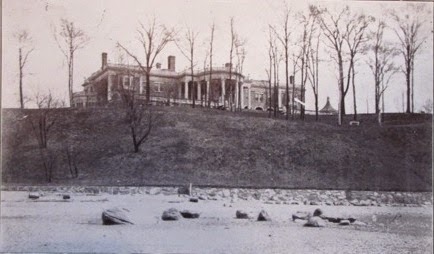 'Martin Hall', the James E. Martin estate designed by Little & O'Connor c. 1900 in Great Neck. Click HERE for more on 'Martin Hall'. Interesting angle; to the right of the house it looks like a tent has been pitched ... & yet the trees indicate the weather is cool to cold? Glad to see that the Dilettante is back with his sharp eye. Yup, that's exactly what it is ~ the roof of the small, picturesque, water tower next to the formal garden. No doubt we'll be seeing more of it later.